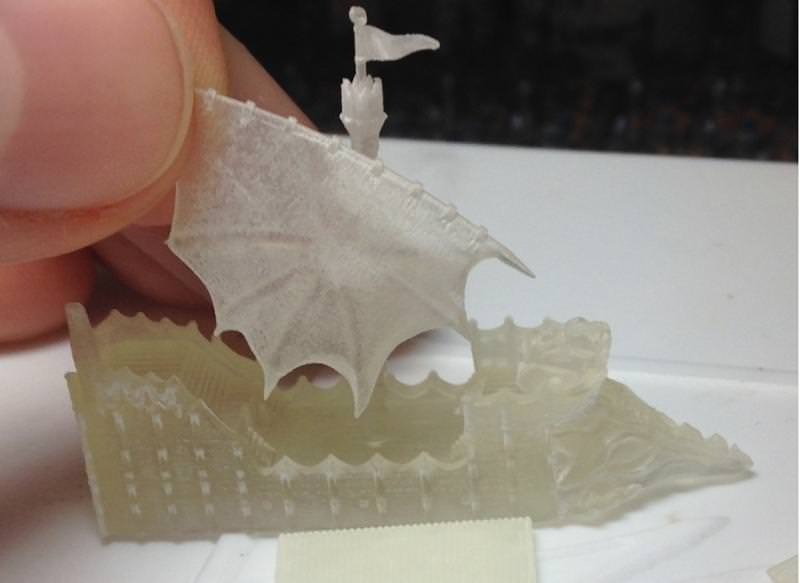 Test print should be coming from Shapeways of the dark alliance ship. In the meantime, I'm interested in opinions of the orc and elf art below. 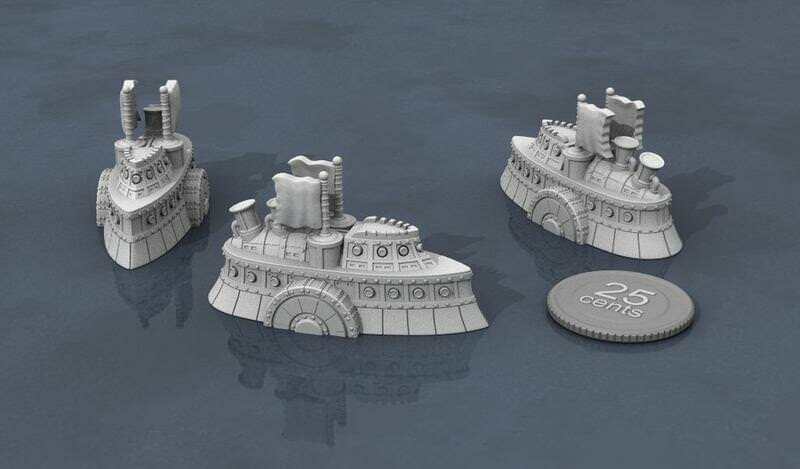 The ramshackle nature of the orc ships makes me think I should have them hand sculpted...although not sure if they would then look too different from the rest of the line. Really like the Orc ships (and I'm generally not a fan of Orcs to begin with). I like the Elven towers, not sure I like the highly arched hull look though. Very comical, don't personally like it. 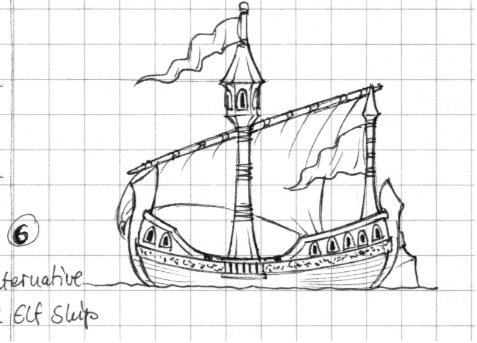 Flatter, but with towers and elegant prows would look better IMO. On Orcs - how about multi-part stuff? 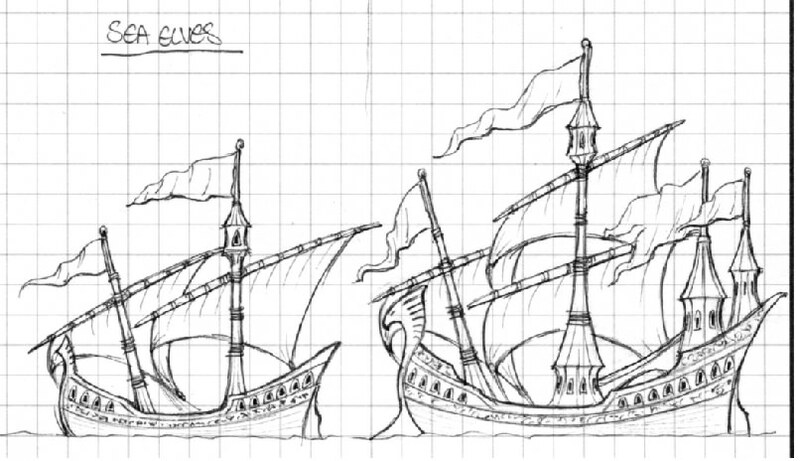 Hulls and upper decks/towers with spaces fore and aft to fit one or more towers each? You could go completely ramshackle by having lots of types of tower/hull combinations and sizes while still keeping the CAD style. Otherwise, I very much like the look of the concepts. I can see much want in those hereabouts. I passed along the feedback regarding the elf ships. So, something a bit more like where the prow section is on a constant lower plane than the aft section, with only the aft section having that upward sweep? The sculptor incorporated the sail feedback for the Dark Alliance ship. I got a test print to see how it looks in the flesh, which is pretty awesome. Its a bit hard to photograph the material though. There are a few issues to iron out. For the oar banks, the tabs meant to secure it to the huill are too small and delicate, so I am thinking of shifting over to a longer single tab that slots into a depression in the hull. The other issue is that the peg for the sail and hole in the mast are way too small. To correct this, the mast as well as the yard (?) would need to be beefed up a bit...but I kind of like the proportions as they are now. The dwarves were my fleet back in the days. The concept drawings are fantastic! I definitely think elegance and 'sweeping' should be how someone should describe the Elven ships. As long as the main hull integrates with the very attractive, swooping prowheads and towers you'd be on to a winner. Definitely keep those aspects! Maybe both fore and aft being tiered or swept will look better, the more I look at it the less I'm convinced one end or the other should be lowered or flattened. Perhaps a slightly more shallow curve but still tiered? I REALLY like the look of the Dark Alliance galley there. The proportions are great as-is, but I don't think a little beefing of the yard (that bit on top of the sail that it hangs from) would be bad at all, especially if it helps secure everything. On oars - they seem rather thin. I expected those pieces to be more of a wedge, angled downward from the hull, making a larger area to attach to the hull. Will there be space beneath them once they're attached then? Dwarfs? Well I might not need any myself, but I almost wish I was collecting a fleet all over again - those are crackin'. I might be tempted to make the upper superstructure a little more angular around the top; rounded when viewed from above but flat-topped so angular from the side, as if the tiers are all traversible decks, but that's taking nothing away from how good they look now. 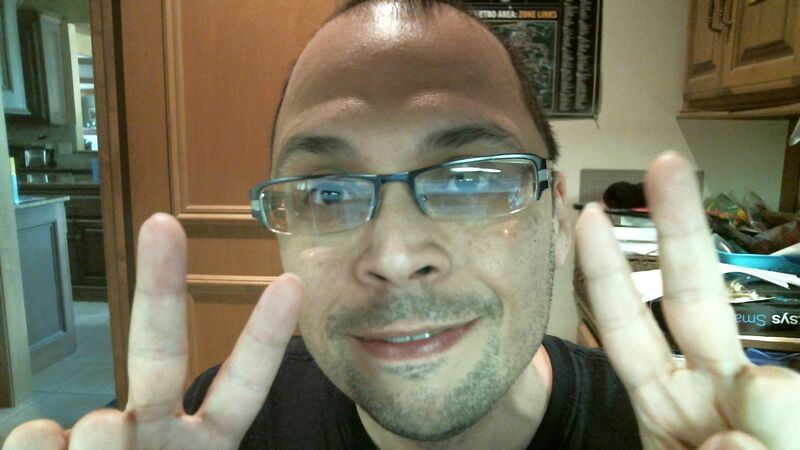 Thumbs up so far! Now, how are those Orcs doing? Last edited by Doomkitten on Wed Dec 06, 2017 11:26 pm, edited 1 time in total. This is super awesome. Just putting that out there. The oars will be designed so they are basically angled down from the hull into the water. I just sort of laid them next to the hull in the pic, because the little holes in the hull were too small for me to secure the oar bank. Would you prefer beefier looking oars? I will post up some more orc previews in a few days. Not sure I'd say 'prefer', but they'd certainly be sturdier if you made a wedge with the underside just being handwavium, painted black, as a compromise for making them not fall off/break so easily. For instance: shows the supporting material 'wedge' beneath the bank of oars that I mean. I think they look fine as they are, but construction-wise might benefit from that bulk to hold them onto the hull. On Elves, I think the slightly less swept look is great! It definitely benefits from a reduced curve (at least in my opinion), but still having some swoop to it helps accentuate the shape with the elegant towers and prow decoration. I like that concept! Northing wrong with making the yard a little more sturdy. I always hated how thin the Man O War ones were. 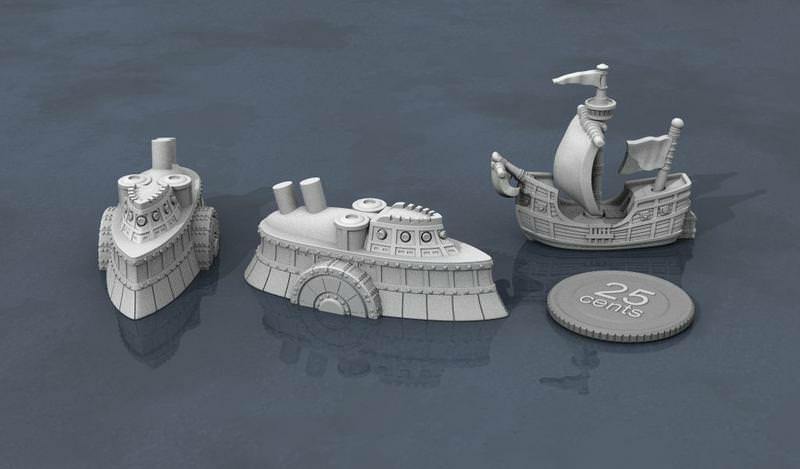 Dwarf ship sculpts are well underway! 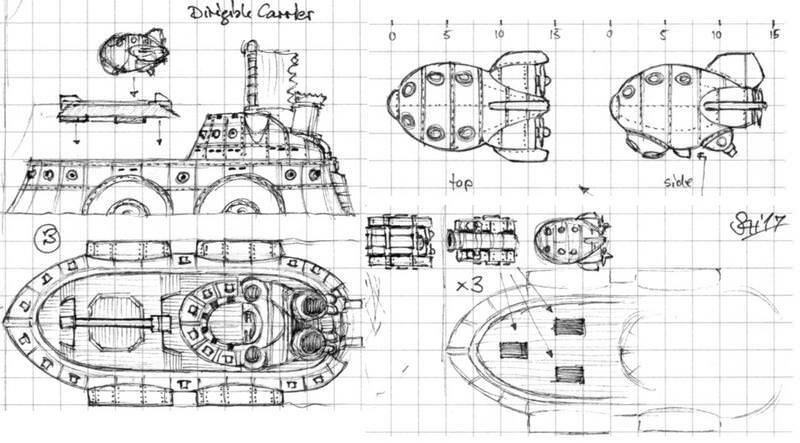 Dwarf Dreadnought is pretty much done here. 49mm long. The first 2 fleets for release will likely be the dwarves and orcs, Dark Alliance and Elven Kingdoms will be the second batch.